Pra Kru Pra Putta Chinarat Sacred Clay Ancient Amulet with gold leaf covering from the Great Luang Phu Yim, of Wat Jao Jet Nai, in Ayuttaya. Pim Yai (large model), the amulet is famously renowned for its Kong Grapan Chadtri and Klaew Klaad Protective Power. Master Gaeji Ajarn of Pra Nakorn Sri Ayuttaya of the second world war Era, and the Indojin War. LP Yim was befriended on best friends basis with the Great Master Luang Phu Jong of Wat Na Tang Nork (Ayuttaya), who was slightly older than him by three years. This beautiful Pra Putta Chinarat Buddha image was made sometime after Luang Phu Yim began to release amulets in the year 2475 BE, making it almost a Century old. Extremely rare, this Pra Kru Master-Class amulet is one of the classics of Luang Phu Yim, and a highly esteemed amulet of the amulet appreciation societies. Many of Luang Phu Yim's amulets were made from red coloured earthen sacred clay, and also other coloured powders including creamy white, gray-green, brown and black powders. He made amulets in many different forms, including this Putta Chinarat, pra Ngop Nam Oy, Pra Gleep Bua, Pra Khun Phaen, Pra Khone Samor, Pra Somdej Prok Po, Hanuman, Pra Pim Hyod Nam Luang Por Dto, Pra Put Song Hanuman (3 versions; gazing left, right, and with large head), Pra Somdej Rasamee, Pra Ruang Yern, and other amulets. Luang Phu Yim always followed the ancient methods of having the block press molds made from stone, using the finest artisans to carve the designs. he would always make his editions according to the Buddhist method of pressing the same number of amulets as the number of sermons in the Tripitaka (84,000). Made from Nuea Din Phao (baked clay) Another intimate friend and colleague in practiuce was Luang Por Parn of Wat Bang Nom Kho, who was exactly the same age as Luang Phu Yim. All three of these Masters would constantly visit each other at their respective temples, and swop and share the various magical Wicha of Buddha magic they had learned in the time they had not seen each other. It began to be spoken, that all three of these Monks and their amulets had special power. They were said to be full of Puttakun and Metta Mahaniyom power, and strong with Kong Grapan Chadtri invincibility. When any of these Masters would make amulets, the other two friends would always be present to help perform the Puttapisek Empowerment ceremony at each of the three temples. The rest of course, is History and common knowledge in Thailand. All three of these Masters are of the most revered Masters for amulets in Thai Amulet history, especially Luang Por Parn with his Bang Nom Kho amulets (Pra Putta Jao Pratap Sathw - Buddha image riding on animal figures). Apart from sacredness and certainty of power in this amulet, it is a wonderful example of old style clay 'Kru' amulet and was made at the same time with and in the same manner as Luang Por Parns amulets. The amulet is thus interesting not only for having been blessed by Lp Yim, LP Parn and LP Jong together, but also for students of authenticity of Luang Por Parn Wat Bang Nom Kho amulets, who wish to study the Muan Sarn sacred powder and its aging process in order to fine tune their abilities of recognition. This is a popular amulet to rent for the purpose of study, because it was made in the same way, from same substance same blessings and same method of Kru as the classig Wat Bang Nom Kho amulets themself. 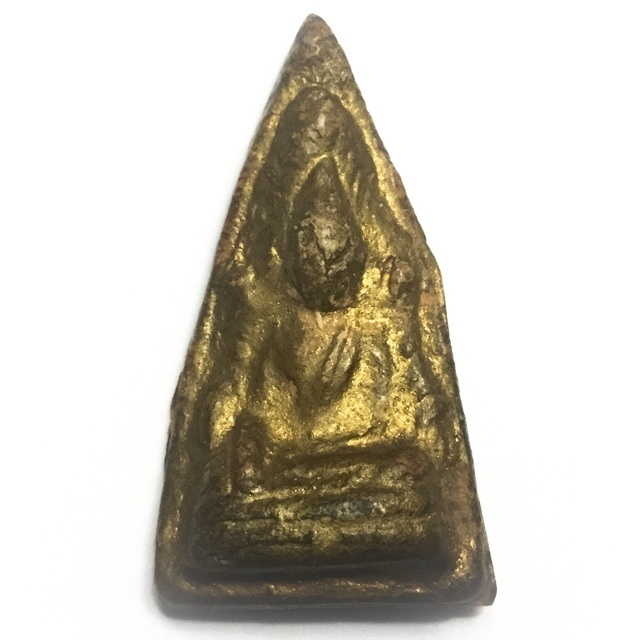 As to sacredness, this goes without questioning, and it can be concluded easily that this amulet is a perfect and much cheaper alternative to a Wat Bang Nom Kho amulet from Luang Por Parn.